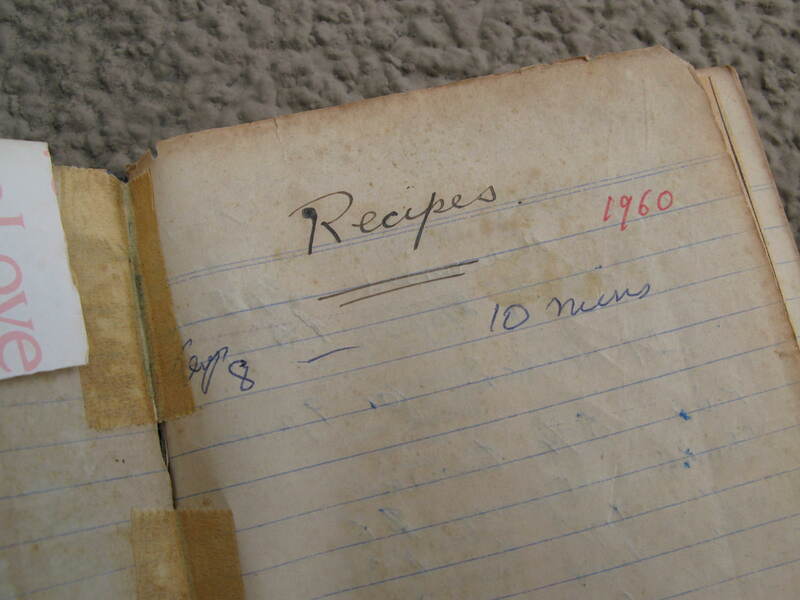 This is the oldest recipe notebook of my grandmother’s that I have. It has been wrapped in more recent years, maybe the 1990s, with recycled giftwrap. This is the actual cover. Can you make out the faded logo? It says ‘Federal Stationery 250’. Here are some of the first few pages. Note the date: Dec 22nd, 1957. 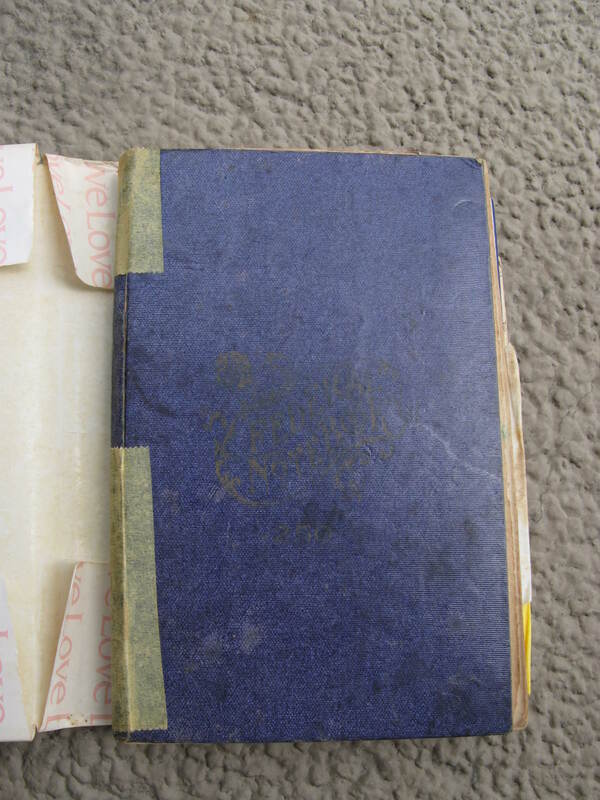 9/3/08 update : I’ve just come across a page on Rose Syrup dated 24 October 1955! 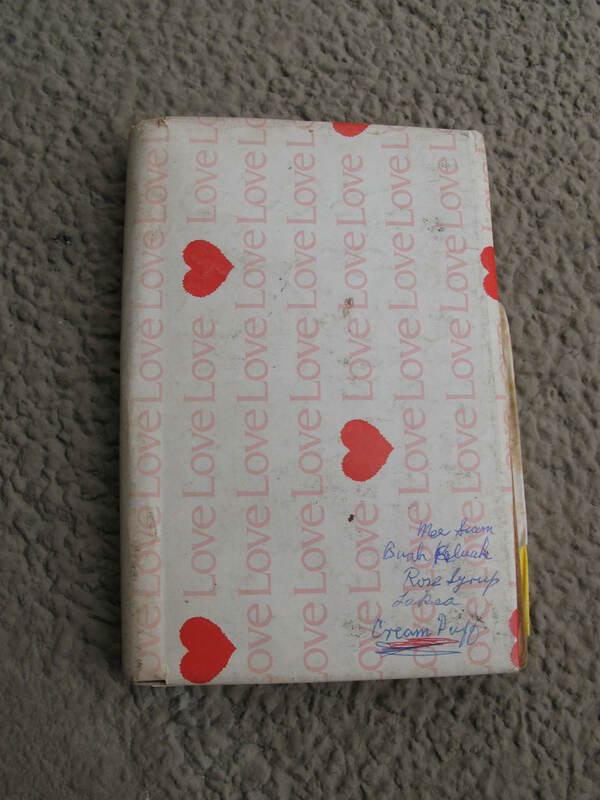 So it appears that this notebook was not started in December 1957 as I noted above. Grandmother did not fill in the pages sequentially, so the front page dated 22 December 1957 simply indicates that she had added in that information at that point. In some of the entries on this blog, I’ve made some observations about changing perceptions of food in the decades that these cooking notes were made. Came across this British Nutrition Foundation page which points out some of the changes between 1952 and 1992. I’m sorry, I don’t know and there’s nothing in my grandmother’s recipe notebooks either. If you haven’t already seen this book, you may want to refer to “The Chinese Pregnancy and Confinement Cookbook” by Ng Siong Mui (Singapore: Landmark Books, 1990) which is available at many branches of the National Library in Singapore. Good luck finding an appropriate recipe! Hi, you might be interested in this recipe – I am a Hakka chinese woman married to an Portugese Eurasian hubby. I used to drink a glass of my mum’s rice wine every Chinese New Year since I am a little girl. 30 斤 glutinous rice, soak overnight and steam till cook. Transfer to a ceramic pot (the type that soak the salted veg in the market) or any glass/clay pot that you have. Sprinkle with 红漕, put a muslin cloth around the pot and cover with a lid. Have to put a stone or something solid on top to sit on it. On the 9th day, use your fist and press the centre of the glutinous rice to turn it over. Keep it cover for another 21 days. U can squeeze the wine out using the muslin cloth. This recipe makes about 20/30 bottles. Remember, do not bring any food near the pot as the smell will over-right the wine. Chinese saying　小气! Sorry, there is a mistake on the wine recipe. After checking with my mum, she said it should be 1 to 1 ratio and that is for every amount of glutinous rice is to one wine biscuit. The rest of the steps are correct. 1 斤 glutinous rice = 1 pc of wine biscuits. Thank you for sharing your family recipe, Carly. I have an old YWCA Cookery Book of Malaya edited by Mrs A.E. LLewellyn, 8th Edition published by YWCA reprinted in 1958. I believed there are some other editions printed earlier and those recipes hand written matched to those printed in this book. 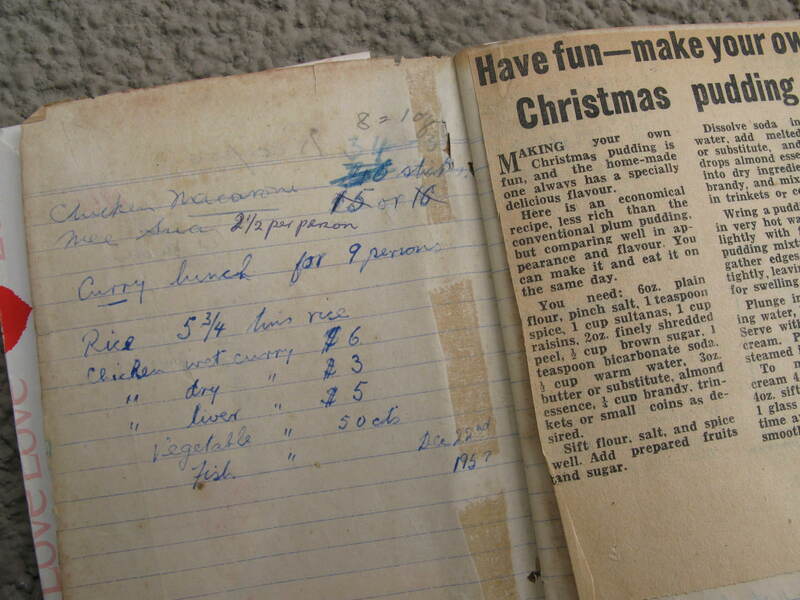 Thank the Granny who painstaking wrote those recipes in her handwriting in her note book. Should there be any recipes written in her note book which may not be clear to decipher and should it be inside this book, I would be delighted to scan them if you need them. I believe not all the recipes are in this 8th edition. Most likely the YWCA of Malaya/Singapore may have kept a file of their printings. By the way, this book was kept by my late mother who passed away some years ago. Thank you so much for offering to share. You are lucky to have inherited a culinary heritage from your mother. There are copies of the YWCA cookery book in the Singapore National Library as well. I have not checked if my grandmother’s handwritten notes are exactly the same as the published ones. I think she collected the recipes from friends in YWCA or directly in the cooking classes.